Borderlands Community Mod Manager Learn to use it. THIS MOD MUST BE MERGED IN BLCMM TO BE USED CORRECTLY! Made a fix for the Grinder requiring 40+ items to grind. This fix ONLY applies for the first time that you load in-game from the Main Menu. This is due to the object changing into an extremely random combination of stuff once you save and quit and load back in. This mod is a little different than most due to a method that a friend and I figured out. Instead of 1 mod it includes 2 with names to match. Part 1, also known as the "Activator", is the only thing you will add to any of your mod packs. This simply enables special actions caused by Tab, I (eye), and E. These keys retain their normal functionality. Part 2, also known as the "Customizer", you do NOT add to any of your mod packs. Instead, you customize it with BLCMM! 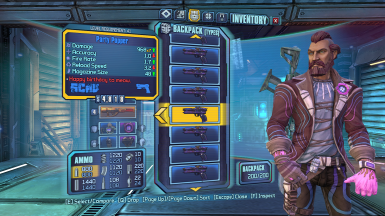 This mod MUST be added to your Binaries directory for The Pre-Sequel! This will allow you to customize your Bank and Backpack Space in various ways with individual options. Make your Backpack Space be a total of 40 at the Default option, all the way up to 200 capacity. Make your Bank/Vault Space be a total of 40 at the Default option, all the way up to 200 capacity. 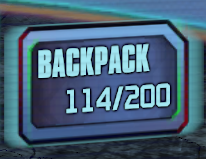 Make your Backpack have "Unlimited" capacity*, which doesn't change the size but rather you can keep picking up loot. I limited the capacity to 200 due to negative impacts on game-play in terms of loading your Backpack and Bank. * Be warned, this option can have adverse effects on game-play. Question: What happens if you have X amount of items in your Backpack or Bank from the mod, then you forget to execute it? slots until it is back to vanilla capacity). need for exiting or restarting! If you need help with specifics, feel free to join our public community Discord server! I'm usually available to help.